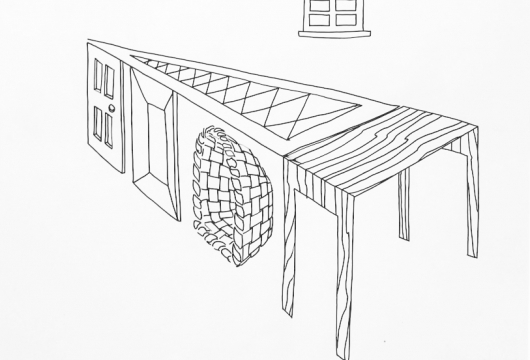 Nolan/Eckman Gallery is pleased to announce Interactions, an exhibition of recent works on paper by Richard Artschwager (b. 1923). On view will be recent charcoal and pastel on paper drawings depicting road landscapes, interiors, and found media images, marked by Artschwager's famously stoical indifference. Artschwager has long been fond of gleaning imagery from newspapers for his paintings; the coarseness of the newsprint and the Benday dots that compose the printed photograph leave the image rough, slightly blurred. Artschwager utilizes the tactility and texture of paper as a distancing measure, as a way to remind you that what you are looking at is a construction—that it is art. In presenting his subjects in severe and odd perspectives and shifting between sharp and phantom-like focus, he defamiliarizes the familiar in order to present it anew to the viewer. Sometimes our gaze dominates the drawn landscapes with views presented from above; other times our view is relegated to that of an ant. Though he is known throughout the art world as a painter, sculptor, and photographer, Artschwager's irrepressible knack for evoking the uncanny during the act of perception is present throughout these drawings. 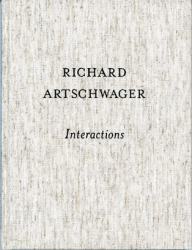 Richard Artschwager first exhibited in New York in 1959, and was represented by Leo Castelli Gallery for many years. His work has been seen in galleries and museums around the world and continues to be highly regarded. In 2003, retrospectives were organized by the Guggenheim Deutsche Bank, Berlin, the Winterthur Museum, Switzerland, and the Museum of Contemporary Art of North Miami.